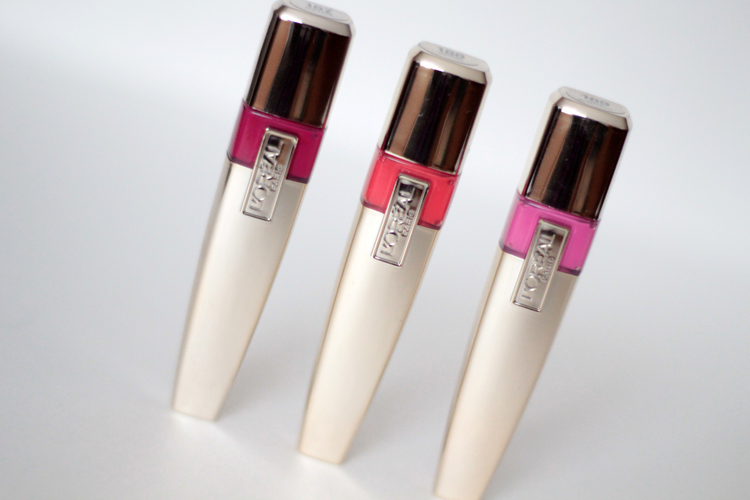 I finally picked up a few of the new(ish) L'Oreal Caresse Shine Stains! I've been seeing posts on these floating around in the blogosphere, so naturally I had to pick them up. Plus, I do have a thing for lipgloss-stain hybrids. Especially after hearing their similarities to the YSL Glossy Stains. I have a slight obsession with those. In total, there are twelve colours in a variety of hues. From neutrals to purples to reds. There's a colour for everyone, though the formulation might not be for everyone. 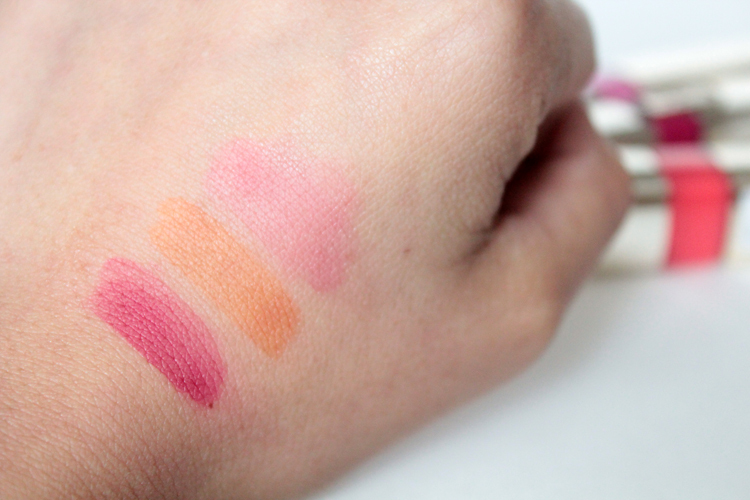 If you've never tried this new breed of lippies then it may take some getting used to. It feels like a watery gloss when first applied. It doesn't sound glamorous but I assure you, you have full control with the product. Application is generally smooth and even, some shades more so than others. When applying, I found it worked best to wait a few seconds between coats. 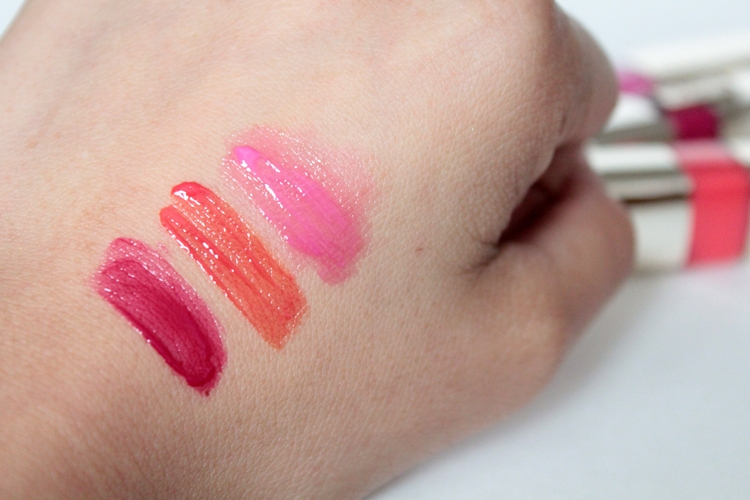 Unlike lip glosses, which you can pile on and on, these Shine Stains need a little time to set or else it gets goopy. The applicator is nice. A tear drop shape to create a sharp edge. These stains are also accompanied by a fairly strong scent. Luckily it does fade quickly for those with fragrance aversions. A vivid fuchsia in the tube, but a deeper version applied. 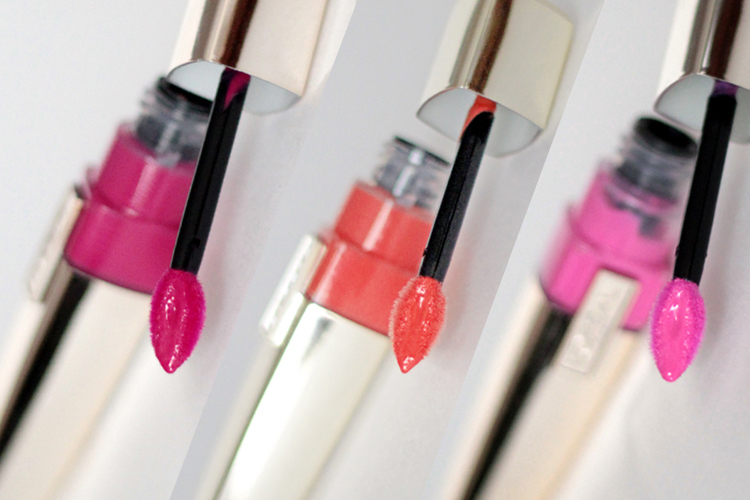 Out of the three, Infinite Fuchsia left the most pigmented stain. A bright orangey coral. Leans much more orange on me than coral, but it will make a great Spring / Summer colour. A blue-based pink. This is the sheerest of the three, but it's buildable. All three wear well. The lasting power varies. Infinite Fuchsia leads the pack at around 5 hours with minimal eating / drinking. I attribute it to the deep pigmentation. While the other two faded around the 3-4 hour mark. I found them to be comfortable on the lips and I didn't experience any drying (but I have only tried each colour once or twice). I haven't worn these long enough to make a definitive comparison to the YSL version. One thing I have noticed is that the L'Oreal Shine Stain seems to take an extra coat or two for an even coverage, as opposed to the YSL Glossy Stain, which only takes me two coats no matter the colour. Expect something more substantial in a future post. Super gorgeous!! The Infinite Fuchsia is especially nice, would be great for a no-fuss stain on a night out! I have three of these (Infinite Fuchsia, Rose On and On, and Lilac Ever After) and they are my all-time favorite lip product. I've been wanting to try the YSL Glossy Stains, but I just can't bring myself to splurge on them, so when these were released I jumped at the chance to try a similar formula. I just adore them! I find them incredibly comfortable to wear (super moisturizing) and the lasting power is fantastic. My only complaint is that they do dry darker on the lips than the initial color, so you have to be aware of that as sometimes you end up with a much bolder lip statement than you intended, but otherwise these are holy grail for me. For the quality the price can't be beat. I just hope they release more shades soon! So I regularly use YSL glossy stains and swear by them to get that slight pop of color. I saw the at the local target and the first I thought of (1) how comfortable it feels. almost like lip balm (2) exactly like YSL but way better pigmentation.